Keywords: National Vocational Qualification Framework (NVQF), National Qualification Framework (NQF), Technical and Vocational Education and Training (TVET), Recognizing Prior Learning (RPL). 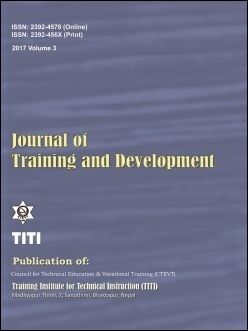 A purpose of this study was to understand whether NVQF is the necessity for the sustainable prosperity of TVET sector of Nepal or just a waste of money. The study had been carried out applying qualitative methodology in the form of narrative enquiry. The understanding and perception of five TVET experts were detailed with the help of following questions, viz. (a) how do you perceive for the necessity of NVQF in Nepal and (b) what are the major challenges and how can we cope with these challenges for the successful implementation of NVQF in Nepal. The experts understanding and experiences revealed that not only NVQF but also NQF are in dire need to streamline the education system of Nepal. However, there are many challenges and issues both at the policy level and at the implementation stage. These challenges and issues need to be strategically addressed from the very beginning of the NVQF project, otherwise, it could be just like “pouring water into sand”.